You may frequently hear the term "HVAC" which is used to describe home heating and cooling systems. The acronym stands for Heating, Ventilation and Air Conditioning, which are the 3 primary functions of a home system. They control air temperature and humidity, and maintain the quality of the air in the home. Local heating and cooling produces warm or cool air at the location where it is needed and serves small spaces. 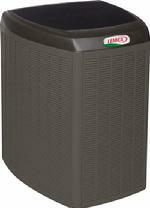 Room Air Conditioners and Packaged Terminal Air Conditioners (PTAC) are examples of local heating and cooling. Heating systems keep your home warm and comfortable. If you live in a particularly cold climate, the function of your heating system is a high priority. Most Central heating and cooling systems are classified as forced air systems, because they send air through ductwork for distribution. The ductwork can contain products that filter or clean the air. Radiant systems create heat and deliver it using components such as radiators that distribute the heat into the home. Boilers are a traditional radiant heat source. Products such as room air conditioners are local cooling options for smaller areas within homes. Instead of delivering cooled regrigerant to a coil and then to ductwork, a room air conditioner contains all the components in a single unit and blows air directly into a room. Air Conditioned homes often have sealed windows, because open windows would disrupt the attempts of the control system to maintain constant temperature.